The Sustainable Rangeland Management Project (SRMP) funded by IFAD and implemented through the International Land Coalition (ILC) National Engagement Strategy (NES) process in Tanzania by ILRI, the Ministry of Livestock and Fisheries, the National Land Use Planning Commission and local NGOs, has supported district and community authorities to carry out joint-village land use plans as a way to secure rangelands and contribute to land conflict resolution between farmers and pastoralists. The process led to the protection and certification of a shared grazing area that has been called OLENGAPA, to incorporate a part of each village’s name in Kiteto District, Manyara Region. See also the blog post Joint village land use planning for the resolution of conflicts in Tanzania. 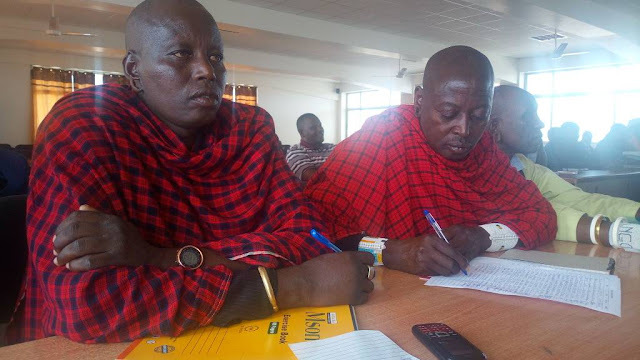 In 2015, the OLENGAPA Livestock Keepers Association (OLKA) was established as a body to manage the shared grazing area. Its membership is made up of all livestock keepers in the four villages that share the OLENGAPA grazing area. OLKA is a member of the Tanzania Livestock Keepers Association (TLKA), established in 2006 in order to protect and advocate the interests of pastoralists and other livestock keepers in Tanzania. TLKA has offices in thirty-seven districts all of which have a proportionately high number of livestock keepers. On 14 to 15 May 2018 a meeting of the TLKA took place in Dodoma, officiated by the Minister for Livestock and Fisheries, Hon. Luhaga Mpina. The meeting was attended by around 180 participants including representatives from the OLENGAPA LKA, facilitated by local NGO KINNAPA. During the meeting there was a presentation of the joint village land use planning process that had been piloted in OLENGAPA, which the Hon. Minister described as “very inspiring.” The presentation started a discussion on the ongoing problem across the country of protecting enough grazing for Tanzania’s significant livestock population. With increasing competition for land, a growing human and livestock population, and insecure land rights the problem is not easily resolvable, often leading to conflicts between land users. The Minister highlighted the urgency for all Districts to set aside grazing areas for livestock, and the importance of carrying out and implementing village land use planning. With a lack of budget available at a local level for such planning this is no easy task. Even where villages have land use plans, enforcing them is an ongoing challenge with, for example, constant attempts by agriculturalists to encroach grazing areas. Other problems raised included conflicts with conservation areas and the high taxes placed on livestock at point of sale – in some places reaching TzShs23,500 (approximately US$10) per head of cattle – and high costs for veterinary treatment. Determined to make the most of having the Minister’s attention, the OLENGAPA livestock keepers explained how the joint village land use planning had helped them protect their land, yet now needed funds for investing in livestock infrastructure and rangeland improvements. The Minister recognized the value of this innovative process and expressed interest in scaling up the methodologies of joint village land use planning to other areas, as well as further supporting OLKA in their endeavours. This blog was originally posted on the IFAD Social Reporting Blog in July 2018.